Turn left onto University Parkway, driving west to I-75. Take I-75 south to Exit 205, Clark Road (Route #72), the last exit in Sarasota driving south, and the first exit driving north. See From Exit 205 on I-75 below. Take Memorial Highway (SR-60 E) south to I-275. Take I-275 south to I-75. Take I-75 south to Exit 205, Clark Road (Route #72), the last exit in Sarasota driving south, and the first exit driving north. See From Exit 205 on I-75 below. Take Daniels Parkway west to I-75. 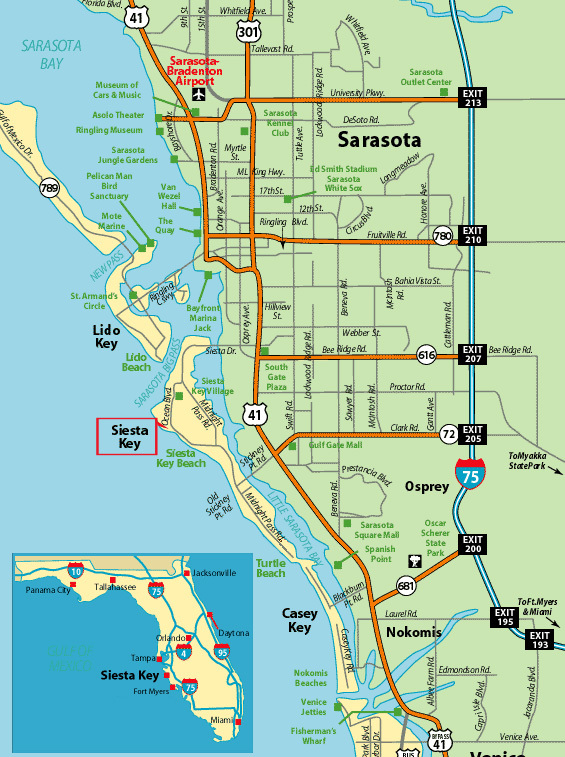 Take I-75 North to Exit 205, Clark Road (Route #72), the last exit in Sarasota driving south, and the first exit driving north. See From Exit 205 on I-75 below. Take Airport Parkway west to Roosevelt Boulevard (SR-686 E). Turn left onto Roosevelt Boulevard and drive southeast to Ulmerton Road (SR-688 E). Turn left onto Ulmerton Road and drive east to Roosevelt Boulevard N (SR-686 E). Turn right onto Roosevelt Boulevard N and drive south to I-275. Take I-75 south to Exit 205, Clark Road (Route #72), the last exit in Sarasota driving south, and the first exit driving north. See From Exit 205 on I-75 below. Drive south on Airport Boulevard to South Access Road. From South Access road turn left onto Boggy Creek Road. Merge onto FL-417 South / Central Florida Greenway. Merge left onto I-4 west. Merge onto I-75 south at exit 9. Take I-75 south to Exit 205, Clark Road (Route #72), the last exit in Sarasota driving south, and the first exit driving north. See From Exit 205 on I-75 below. From Exit 205 on I-75: Drive west 5 miles, Clark Road turning into Stickney Point Road at Swift Road, then crossing over Tamiami Trail (US 41), Stickney Point Road then ending at Midnight Pass Road once you cross the Intra-coastal Waterway bridge into Siesta Key. Make a left hand turn onto Midnight Pass Road and then, a right hand turn into the Siesta Breakers entrance way just past the intersection. From Tamiami Trail (US 41): Turn onto Stickney Point Road and drive west. Stickney Point Road ends at Midnight Pass Road once you cross the Intra-coastal Waterway bridge into Siesta Key. Make a left hand turn onto Midnight Pass Road and then, a right hand turn into the Siesta Breakers entrance way just past the intersection.